Cool Mom Picks thinks they’ve found the cutest rattle of all time, and we think they’re pretty sweet too. 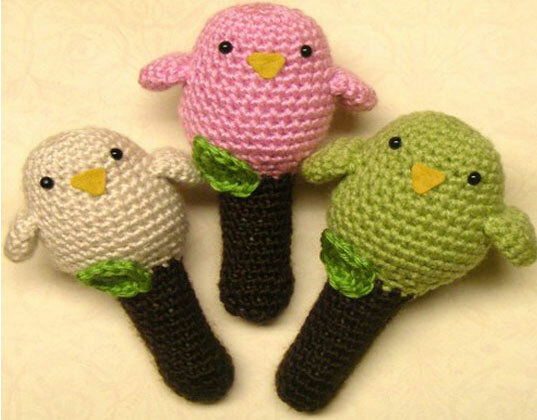 The birdie rattles seen above are hand crocheted by a stay at home mom who sells them in her Etsy shop. Or, get crafty and buy the pattern to make your own. Parents know that piles of laundry are an inescapable fact of life. Check out the homemade laundry detergent recipe offered at Sutton Grace. Whip up a batch – and go green by skipping the chemicals and the packaging of store bought detergents. Tiny Decor Blog features free art for the nursery via Feed Your Soul: the free art project which offers adorable, downloadable PDFs that you simply save, print and frame! Many misty-eyed parents are getting ready to send their kids off to their first day of school. Read this poignant letter to a child starting kindergarten on the New York Times Mother Lode blog and know you’re not alone in your tissue clutching. Thanks for the Etsy link! Cool Mom Picks thinks they've found the cutest rattle of all time, and we think they're pretty sweet too. The birdie rattles seen above are hand crocheted by a stay at home mom who sells them in her Etsy shop. Or, get crafty and buy the pattern to make your own.